Professional Organizers help you get your life and home back under control. We help reduce stress and chaos. We help you make decisions about your belongings. We help you set up systems to make it easy for you to manage your stuff. We help you focus your energy on moving forward in your life. What do Professional Organizers NOT do? Professional Organizers don’t scold or lecture. We don’t make you feel bad about your clutter. We don’t make you get rid of things you love. Is hiring an organizer going to help me get that project done? Yes! When you hire me, that means that you are finally going to get those projects finished. Get those closets uncluttered. Get those unwanted things sorted and donated. Get that garage finally cleaned out. Get that pile of papers on the dining room table filed or scanned or acted upon. Get it done so that you can happily do other things! Could I do that myself? Isn’t it time to get those things done? Isn’t it time to get your life back, your time back, your house back? It will truly go much faster, with me there, than you can do it yourself. I can help you plow through your stuff and get things sorted, and help with the decision process: what to keep, what to donate, what to toss. Once we get that done and figure out what is left, then comes my favorite part of the process. My particular specialty is re-thinking your storage spaces and helping you manage your belongings better, using my experience, knowledge, and strategies I’ve developed over my lifetime. What if I’m too embarrassed to let you see my stuff? My goal is to organize, not to judge. I live in a closet-deficient mid-century house myself, so I know how frustrating it can be to struggle with managing your stuff. And please don’t tidy everything up before I arrive! It makes the problems more clear to me if I can see how the space is not working for you. Are you going to make me get rid of all my stuff? Not at all. Decisions about what to keep, and what to discard or donate, are completely up to you. My goal is to help you make those decisions. Then, I can make your belongings fit into your available space in ways that may surprise and delight you! Do I have to be there to work with you? Not always for every session, because every client situation is unique. But especially at first, I need you there so that you can show me what your particular challenges are, and I can ask you questions about your daily routine. My goal is to design solutions and systems that work for how you really live. If we are de-cluttering, you are the one who has to make the decisions about what is staying and what is going. It’s more fun and goes faster when we do it together! What kind of questions will you ask? I ask you questions about your daily routine and your habits, and how you use the spaces in your home. As one example, where do you set things down when you come in? Where do you pick things up to take with you on your way out? The answers help me figure out a system that will work with your particular space. You want a system that will be easy to maintain with how you really live. how quickly you can make decisions about what to keep and what to get rid of. 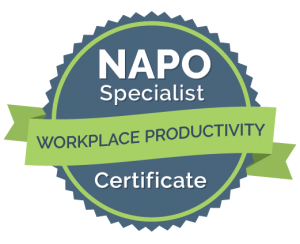 First, my qualifications: I am proud to be a member of NAPO, the National Association of Productivity and Organizing Professionals. 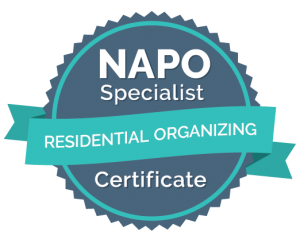 When you hire a NAPO member like myself, you are hiring a skilled consultant with access to professional education, experience with the best organizing skills and strategies, and knowledge of and access to the best organizing products. I continue my education by attending our yearly national conferences. At the 2017 NAPO conference in Pittsburgh, PA, I gave a session on Smart Space Design. But also, I am my clients’ most enthusiastic cheerleader! Some of the work we do together may be very tedious if you try to do it yourself. Let’s do it together and get it done! See my Raves page for comments from some of my happy clients. Call me at (512) 585-9836 for a free phone consultation, to find out if we will be a good fit. I have been a professional organizer since 2009, and I love helping people manage their homes and belongings so that they have time to do the things they want to do! Did I see A Jones For Organizing included in the Best Home Organizers In Austin list on Expertise.com? Why yes, yes you did! 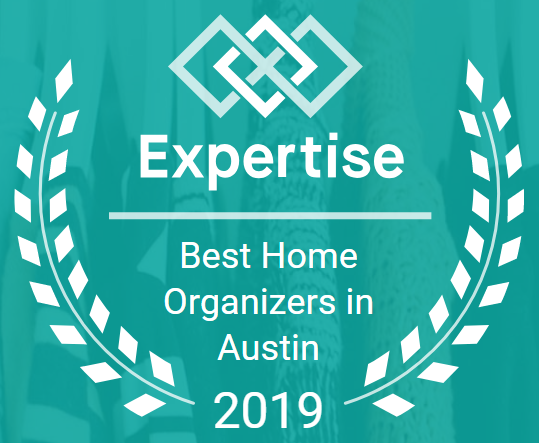 19 Best Home Organizers in Austin for 2017, 2018, and 2019. What about confidentiality and privacy? Your confidentiality and privacy is very important to me. I keep all of my work with you private and anonymous. My testimonials on the Raves page of this website have been posted only after explicit permission has been granted to use names or initials. You can trust that I will handle your belongings with respect, care, and discretion. 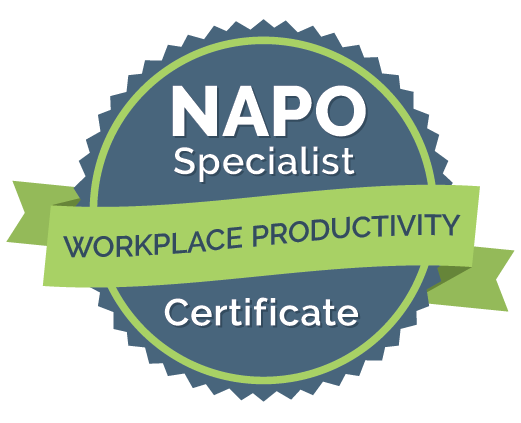 As a member of NAPO, the National Association of Productivity and Organizing Professionals, I am bound by their Code of Ethics. These include keeping all client information completely confidential, both business and personal. I may ask to take photos, because often photos will record details missed at first glance. You would be surprised at how it’s sometimes hard to remember how the space looked, before we started working on it! Photos can help to show us the progress that has been made. I will not use or publish photos of your space without your permission. If you do give me permission, I will take care to remove any identifying details in the photos that I publish. For further privacy, I will remove any business signs on my car before coming to your home or office. Since you are an organizer, is your house perfect? I can locate all of those things quickly because each item has a permanent home. When things get cluttered, I have places to put everything back. Do I love helping other people like you set up homes for all of their things? Yes, yes I do! I take cash, check or credit card via PayPal. Payment will be due at the end of the session unless we make other arrangements. A 24-hour notice of cancellation is kindly requested. Do I have to buy a lot of products before you start? No, because buying storage products should not be the first step. First we need to determine, together, how you use your most challenging areas and help you figure out what you need to keep there. Then I can come up with designs or solutions. I do have years of experience from using organization products and tools, and knowledge of which ones work well. However, sometimes you may already have products that will work just fine. Have I seen you at the Container Store in Austin? Probably! I shop there for products and I worked there as a space planner for 4 1/2 years. (That was a fun job, let me tell you.) Over the years, I have used almost every kind of organizing product out there myself, from the Container Store, IKEA, Target, etc. I know from my own experience which products are good quality, and which are not. I can recommend which products are best for your situation. What areas of Central Texas do you work in? My clients are in Austin, TX and the surrounding areas, including Lakeway, Westlake Hills, Rollingwood, Sunset Valley, Oak Hill, Bee Cave, Spicewood, Cedar Park, Round Rock, Pflugerville, and Georgetown. If the distance is more than 30 miles, there will be an additional travel fee.